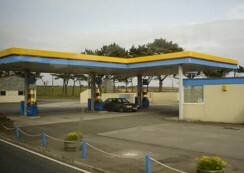 The service station, featured in Barrow Hill, was inspired by the paranormal thriller Sapphire & Steel (Adventure 6), and a real location found on the main road which runs between Looe and Polperro, down here in Cornwall. The service station is a lonely place, based on the hilltops overlooking the Looe valley and Talland Bay. The local maps show that the service station is actually surrounded by Barrow Mounds, and Tumuli. 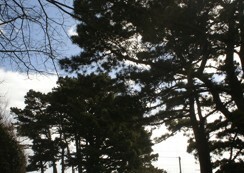 A few pine trees shelter the location from the coastal winds, which whip across the landscape and through the service station, rattling the petrol pumps as it passes. Middle: Pines mark the boundary. 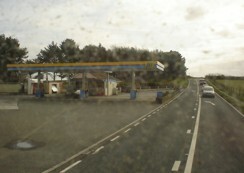 Right: The Service Station photographed through a muddy bus window!